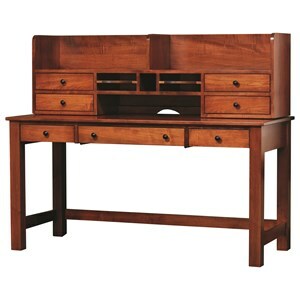 This beautiful L-desk and hutch will transform your office setting. Available in Oak, Maple, Cherry or quarter sawn Oak solid wood, the exceptionally custom desk features three dovetail drawers with full extension glides in addition to a pencil drawer, power suppy cabinet and CPU caddy along with a pull-out keyboard drawer. The accompanying hutch includes two wood doors, adjustable shelf, open letter boxes and a task light. Completed with your choice of hardware and finish options, this set will meet all your home office storage needs. The Rivertown Home Office L-Desk and Hutch by Y & T Woodcraft at Saugerties Furniture Mart in the Poughkeepsie, Kingston, and Albany, New York area. Product availability may vary. Contact us for the most current availability on this product. 2085 Hutch 1 72" 11.25" 39.5"
2080 L-Desk 1 75" 71.75" 30.75"